As any student at IHOP-U will tell you - as they study the "prophetic history" of IHOP - Mike Bickle had his seminal moment concerning IHOP in a small primitive hotel room in Cairo, Egypt, in 1982. It was there that Bickle heard an audible voice - he says it was God - which spoke to him. The voice said "I will change the understanding and expression of Christianity in the earth in one generation." Was that voice God? Bickle claims it was. As such, it, and the "prophetic" foundation of IHOP, must be evaluated (judged). How does one judge the prophetic foundation of IHOP when that foundation constantly changes and not all of the content has even been revealed? I discussed that a while back in my article on the Blueprint Prophecy. Suffice it to say, most IHOPpers today are unaware that the Blueprint "word from the Lord" has changed many times. It's documented and it's true; get over it. Mike Bickle explains that the word about change in one generation, given more than a generation ago, means that unbelievers will "witness God's wonderful yet terrifying power in the church." And so, accoring to Bickle, that change involves the same sort of "signs and wonders" gospel preached by the new-age Bethel Church in California (often to the exclusion of a presentation of the actual gospel). Bickle believes that he will see that change in his lifetime, so we've got maybe thirty years to go. Another part of that change involves the other directives given to Mike Bickle. And he speak of these directives with great authority - after all he has not only heard the audible voice of the Lord, but he has visited heaven. Or so he claims. It is with that authority that he has presented to the church the Harp and Bowl prayer model, which is not just another way of running a lengthy prayer meeting, but it is God's chosen way to usher in the return of the Lord. Over the years many people have glommed onto Bickle's story about the coming change. It frequently is not quoted exactly (although Bickle has probably mis-quoted it himself) and often speaks of changing the "face" of Christianity in one generation. It has been repeated so many times that no one (in the NAR) even thinks to evaluate it. "God has promised that He will change the understanding and expression of Christianity in one generation. I believe we are that generation, and the way that unbelievers perceive the Church will radically change in the next few years." Here's she affirms Bickle's understanding of the "prophetic word" but beyond that she has canonized it - elevated it to the level of scripture. Note that she says "God has promised." 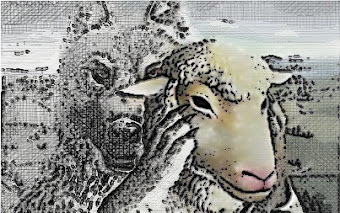 Browning goes on to make all sorts of bizarre new-age claims for the church - such claims which ARE indeed changing the expression of Christianity." She also furnished the requisite lame scripture proof-texts so that to the gullible it seems scriptural. "Everything is vibrating energy, including our bodies." "If our frequency gets low, we get sick." "God provided a way to raise our frequencies by using essential oils." "..hyssop is a releaser of swallowed emotions..."
"Love has the highest frequency of all." She offers 1 Corinthians 13:13 as proof of that: "And now these three remain: faith, hope and love. But the greatest of these is love." I'm sure that was talking about frequency, aren't you? This is what happens when you mix new revelation with new age and junk science. Think this is isolated? Well, I could give you a list of the folks Kari Browning runs with - many in the same circles as Mike Bickle (whom she cites frequently). She even shares a fascination with the angel "Emma" associated with Bob Jones, Todd Bentley and the start of IHOP/KCP in Kansas City. "I was talking with Ray Hughes the other day and was telling him about using a 528 HZ tuning fork as a prophetic act. Someone told me that this tuning fork is called the tuning fork of LOVE. Google it. Ray told me that science has said that this fork is the sound that holds earth. That blew me away!!" Those of you that are bible students probably picked up on this right away. Jesus is the one who "holds earth." So, using a tuning fork is a "prophetic act." I wish I could say "only in California," but sadly this stuff is everywhere. She goes on to echo Browning's claim that love has a frequency. But her frequency range is a bit lower, with love being pegged at only 528 Hz. What? Were you expecting consistency in junk science? "I feel that it's time to put our love on big time- even if it hurts a lot. We need to tune our lives to love. When we tune our lives to love it brings healing. One thing about this 528 HZ tuning fork is that science tells us that the sound of this fork brings healing." "The Ancient Solfeggio Frequencies Codes of Creation that were rediscovered in 1998 are now becoming activated in a stronger resonance field with Gaia and in your DNA and will bring awareness to the masses and you the Light bearers. A profound shift to the Divine Mother Frequencies of Harmonics is creating an Electromagnetic Unity Field of Consciousness to ensure that the Codes of Creation - the Ancient Solfeggio Frequencies - will be used for the highest good of humanity and earth." 528 HZ is one of the new-age Solfeggio Frequencies which supposedly brings healing. 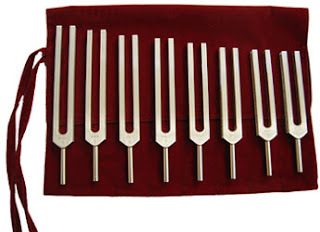 The use of tuning forks for healing is part of the eastern practices of Chakra and Reiki. I have told Beni Johnson this, and I will tell you: we cannot adopt these new age practices and claim that we are simply recovering things the devil stole from the church. I beg you to consider this- if it was important enough for the church to know God would have put it in the scriptures. God did not send Jesus to the cross only to have him replaced by a tuning fork 2000 years later.